Description: A super rich, nourishing, moisturizing, protective, emollient all-over body and face beauty cream, especially useful to soften rough dry elbows and feet. Use to help prevent stretch marks of any kind. It has been promoted as a safe & effective treatment for pregnant belly smoothing. Directions: Massage oil when heated, or use as is to help soften rough, dry skin especially the elbows & feet. It has been used on fine lines, around the eyes & mouth. 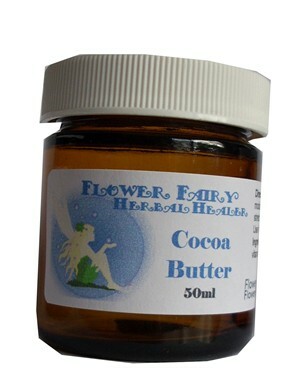 Can apply on skin, on stretch marks or as a prevention for potential stretch marks. It has been promoted as a safe & effective treatment for pregnant belly smoothing. Ingredients: 100% pure, natural cocoa butter. No water or fillers or preservatives. In a glass amber jar.